Water Systems for Rural Villages: DELIVERED! We recently shared with you the great success we’ve had in bringing safe water systems and education to rural villages in Vietnam. 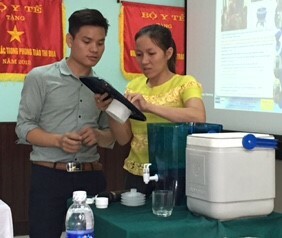 We were able to fully fund 31 LifeStraw safe water systems for rural communities in Thua Thien-Hue Province in Central Vietnam. The systems will be installed in preschools, primary schools and health clinics to make them more accessible to the whole family, and reinforce healthy food and hygiene habits throughout the community. Installation of the water systems were stalled, however, due to excessive flooding in Vietnam. Torrential rains and tropical storms have caused death and destruction, and the community leaders of the villages we committed to sponsor were unable to travel to Hue City to receive them. Flooding began in August and still continues today, causing many other issues for health and infrastructure, especially in the rural areas we serve. Last week, community leaders were finally able to meet with the MEDRIX team to receive the systems and thank our donors, through MEDRIX, for their kind support. Your support of our education and water projects in Central Vietnam truly does make a difference. Children and their families have access to safe water, free from bacteria that causes illnesses, in at least one area of their village. They learn the importance of food safety and safe water for cooking and handwashing. And our local partners are able to tailor their community outreach efforts based on things like the flooding we mentioned, to provide people with the knowledge that is relevant to their daily lives, right now. 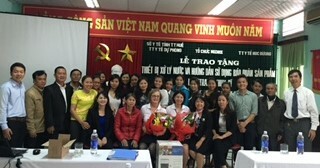 Our supporters like you make a real difference in Central Vietnam, and your impact will continue far into the future. 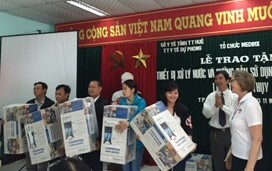 We sincerely thank you for partnering with MEDRIX to benefit kids and families in Vietnam! All of the village leaders and MEDRIX team are represented!